Here are some guidelines to aid in choosing a suitable measurement of absolute air pressure for accurate calculation of Density Altitude and/or Engine Horsepower. Absolute Pressure is the actual pressure of the ambient air. (also called the Station Pressure, Actual Pressure, or Ambient Pressure). To get a feeling for the magnitude of the absolute pressure, the absolute pressure in the idealized International Standard Atmosphere (ISA), on a standard day, is 29.92 in-hg at sea level. At 2000 ft the absolute pressure drops to 27.82 in-hg, at 4000 ft the absolute pressure is 25.84 in-hg, at 6000 ft the absolute pressure is 23.98 in-hg, and at 8000 ft the absolute pressure is 22.23 in-hg. 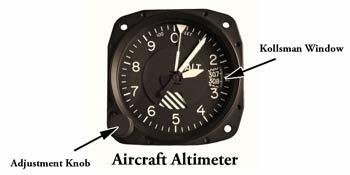 The absolute air pressure may be directly read in the Kollsman window of a properly calibrated aircraft altimeter by turning the adjustment knob until the altimeter indicates an altitude of zero (if the altimeter has sufficient adjustment range to do so). However, this trick is of limited utility since the Kollsman window has a rather limited range. Another method to obtain Absolute Pressure is to set the altimeter to 29.92, and then convert the resulting Pressure Altitude reading to the corresponding Absolute Pressure. For the convenience of pilots, some of my on-line Density Altitude calculators utilize Altimeter Setting and Elevation rather than requiring the Absolute Pressure. For those without an altimeter, many airports can provide the current altimeter setting, and the altimeter setting is included in most US National Weather Service reports. This pressure measurement originally measured the height of a column of mercury. However, since the density of mercury is a function of temperature, the air pressure measurements made with a mercury barometer are also a function of temperature. And to further complicate the issue, a variety of different sensors, some using various liquids and some fabricated without liquids (aneroid), all give similar, yet slightly different readings as a function of temperature. In some specific circumstances, a barometer may accurately indicate the actual ambient air pressure. However, in general, due to the effects of temperature, there will be some difference between a barometer reading and the actual air pressure. Due to the uncertainty of the temperature dependence, barometric pressure readings are not generally appropriate for use in accurately calculating Density Altitude and/or Engine Horsepower. Sea-level pressure is a theoretical pressure at the station if the station were actually at sea level. Unfortunately, there are a variety of slightly different methods used to convert from the actual barometric pressure to the sea-level corrected pressure. In general, conversion from actual barometric pressure to sea-level barometric pressure includes certain effects of temperature. And, due to the various sensors and algorithms which are employed in calculating the sea-level barometric pressure, the accuracy of any conversion from the sea-level corrected barometric pressure to absolute pressure is unpredictable (unless the specific type of sensor and the specific algorithm used to make the sea-level correction are known).